Loft Conversion, How Can I Rid Damp and Mould? Home > Ask Our Experts > Loft Conversion, How Can I Rid Damp and Mould? We had our loft converted into a bedroom 17 years ago. All was fine but now the walls are getting very damp & mouldy. What can I do to rectify the situation and how much will it cost? Damp and mould are normally caused by cold weather mixed with rainy or dry conditions. It normally surfaces in places where there is little air or ventilation, so any excess moisture becomes trapped and can turn to damp. It often likes to appear in corners or on windows and in places that are hidden, so lofts are an ideal breeding ground for it. In order to prevent damp and mould you must first find its cause. Check that there are no leaking pipes or water such as rain getting into your loft through any hidden holes. The water could be coming in through a loose slate on the roof or a blocked gutter. 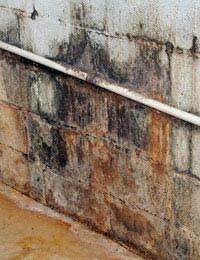 You should check your loft's damp proof course is working properly. A damp proof course is a large piece of fabric that is inserted into the building to stop water from moving about and rising up from the ground. If you don't know if you have damp proofing contact a local loft specialist or builder and get them to asses whether you have this. You can get damp proof cause installed for anything between £500-£2,000 depending on how big your loft is. If you have recently had your house plastered or some building work done it could be that this did not dry out properly and the rain caused it to go damp. If you have very bad damp and mould it may be a good idea to buy a dehumidifier which will help dry your home out, you should be able to pick one of these up for between £50-£200. The first thing to do is not to cram things in too tightly in your loft, make sure there is plenty of room between things you are storing or any furniture as this will also help to let air get to the damp. You should make sure that your loft is insulated and damp proofed, contact your local council as they might be able to offer to do it at a reduced rate. It will normally cost a couple of hundred pounds if you are just getting your loft done. Cavity wall insulation can also help to cut down on damp and mould along with double-glazed windows. Hopefully these measures should help prevent mould in the first place but if mould does keep appearing you can help remove it by cleaning down walls and window frames with a fungicidal wash, which you should be able to buy from a local DIY shop and should cost less then £10. Once you have got rid of the mould you will need to paint or decorate over the exposed areas with a special fungicidal paint to stop any reappearing. You should then try and avoid using normal paint or wallpaper over the decorated area or this will make all your efforts ineffective. How to Convince Building Control that Loft is Not Living Space? I've had a problem with condensation in my loft. This is quite bad at times and drips onto my insulation. This has also started to cause damp on the upper walls in two bedrooms. I have noticed that this has became worse after having extra loft insulation fitted in the summer. I found the vents in the eves blocked with insulation so I cleared this blockage all around the loft space. This made a noticeable difference as I can now feel a slight draft. After a few days I inspected the loft space again only to find the same problem, however possibly not as bad as before. I imagine I need to improve the ventilation within the loft so do you think installing a 4 inch extract fan to the external wall within the loft help?